Hands-on learning about sustainability and the natural world for children and adults at Camp Kernow's off-grid centre. join us for a day of outdoor adventure at camp- build a shelter in the woods, try your hand at the ancient sport of Archery, learn firelighting skills and cook 'bannock' bread on sticks over the fire. Please ensure children bring wellies, waterproofs and a packed lunch. 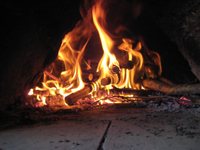 Join us for a day and learn how to build a permanent cob oven using natural materials. 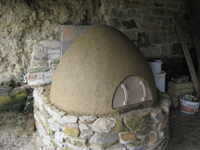 A cob oven is a beautiful structure that you can use again and again for baking and roasting a huge variety of foods including authentic crispy pizza, delicious bread and succulent roasts such as duck and lamb. At the end of the day you will have the confidence to build an oven using material from your own land. The course is also a useful introduction for anyone who has cob buildings in need of repair or restoration. No previous experience is required and you don’t have to be built like a navvy! 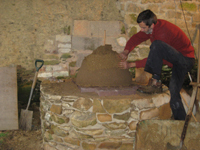 The course will be led by Andrew Hubbard from South Yeo Farm West and is primarily a hands-on course during which you will experience all the stages of building an oven, from shaping the former, building the cob dome and applying an earth render. We will also cover the theory on the basics of making cob, finding suitable soils, and techniques for mixing. Sunday 11th May from 10am to 4.45pm. £65 per person including comprehensive instructions with stage by stage photos for reference (via email), lunch and refreshments. Please send an email to claire@campkernow.org.uk with your name, address, phone number and any dietary requirements or medical conditions we should be aware of. We will send you an invoice (payment is required in advance), booking t’s and c’s and directions on how to find us. Please book well in advance as the course is restricted to 10 participants to ensure hands-on participation for all!